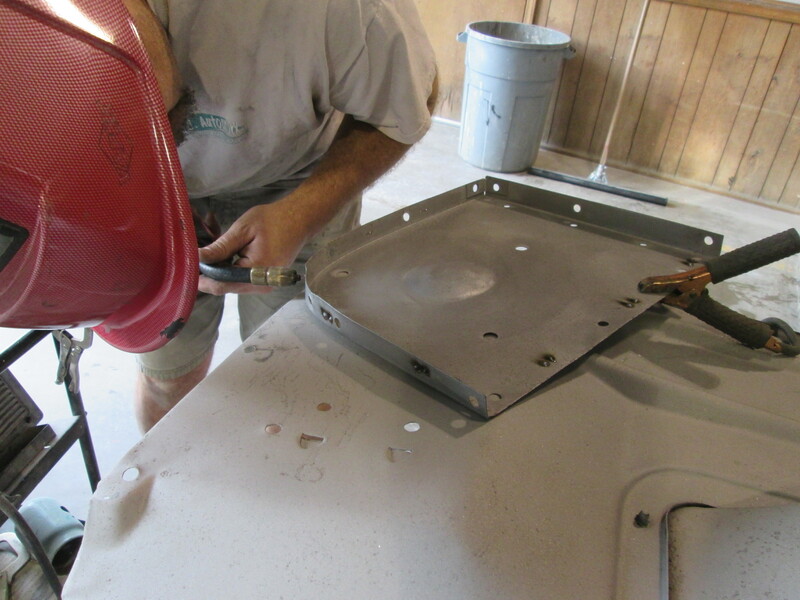 Today Chris and I spent right much time working on the ’52 Ford. 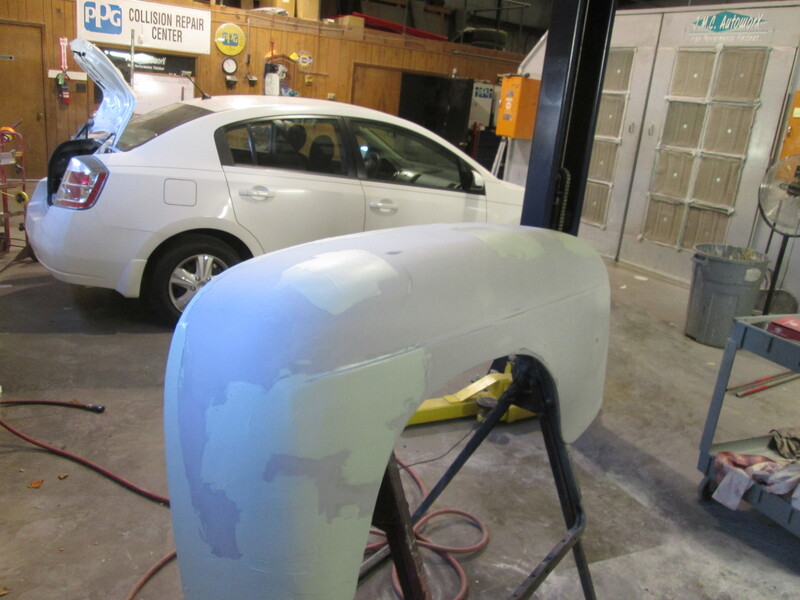 We started this morning by applying Alumifill to the welded areas on the fenders. We then smoothed those areas up, we will finish repairing those areas later. 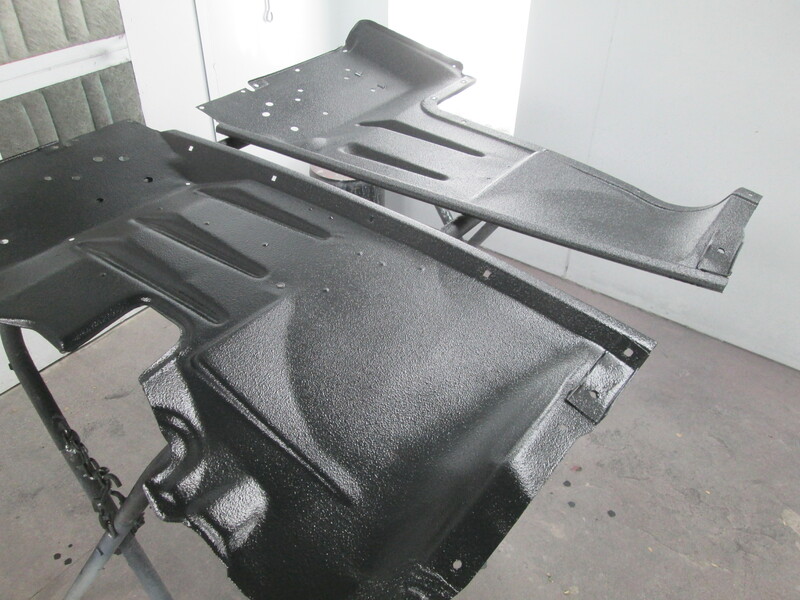 Once all the welded areas were ready, we applied a good coat of DPLV epoxy primer. This seals up all the metal areas. This product really likes bare metal. 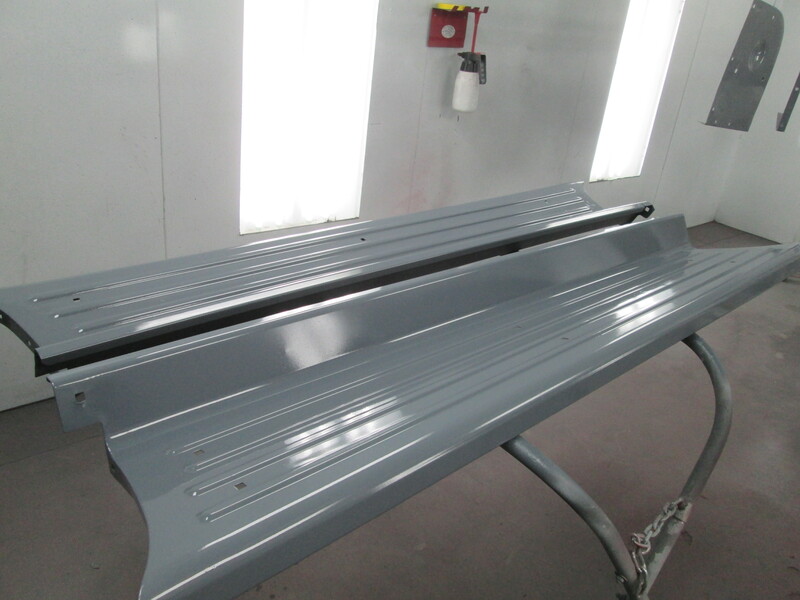 It provides a superb barrier for the metal and it is a great foundation for the subsequent layers. 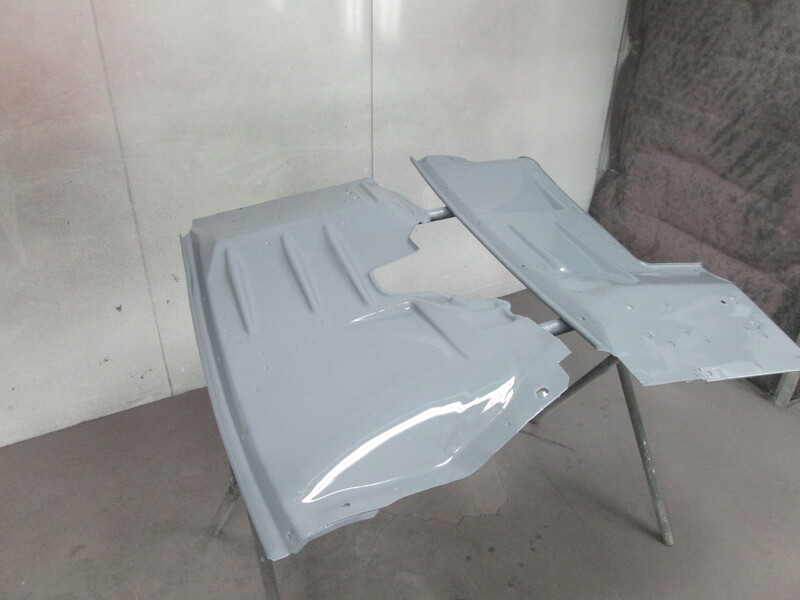 These panels were meticulously cleaned and before this primer was sprayed. 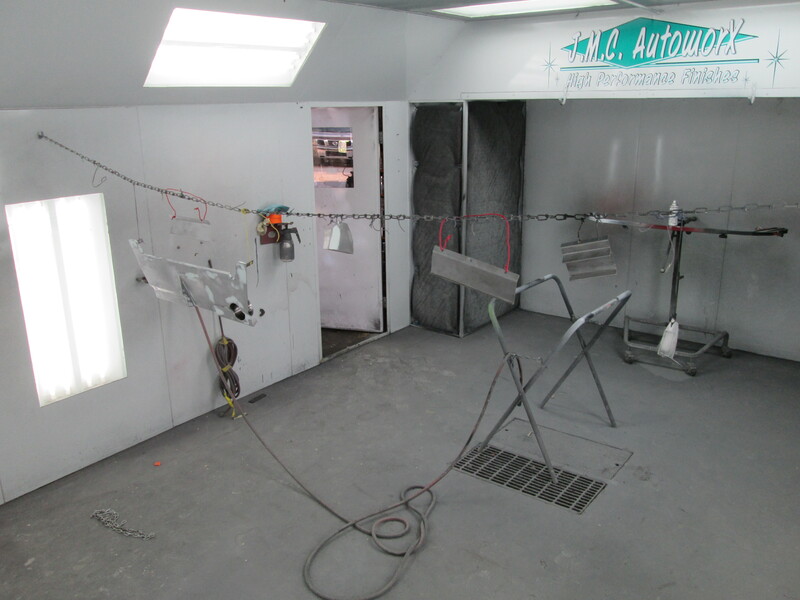 They were wiped down numerous times to ensure they were as clean as possible. 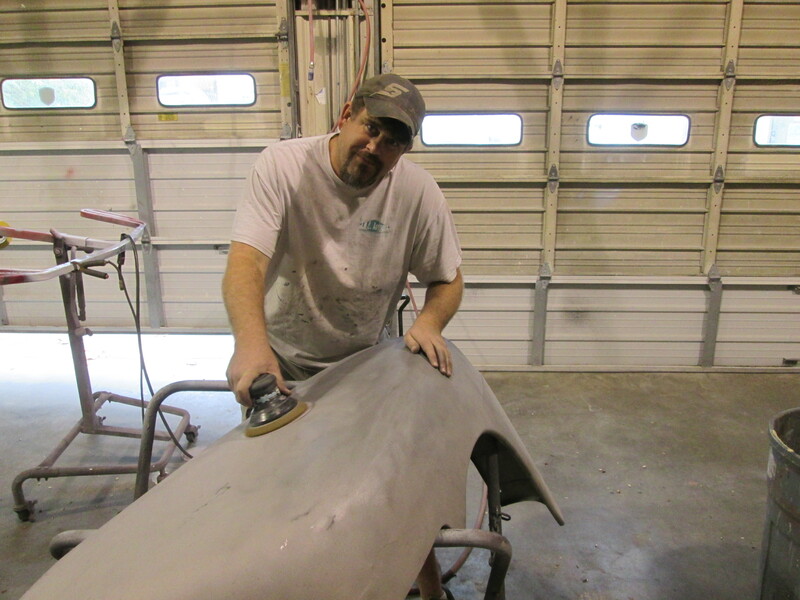 Tomorrow we will apply primer to running boards and the rest of the panels will get a few coats of Slick sand. 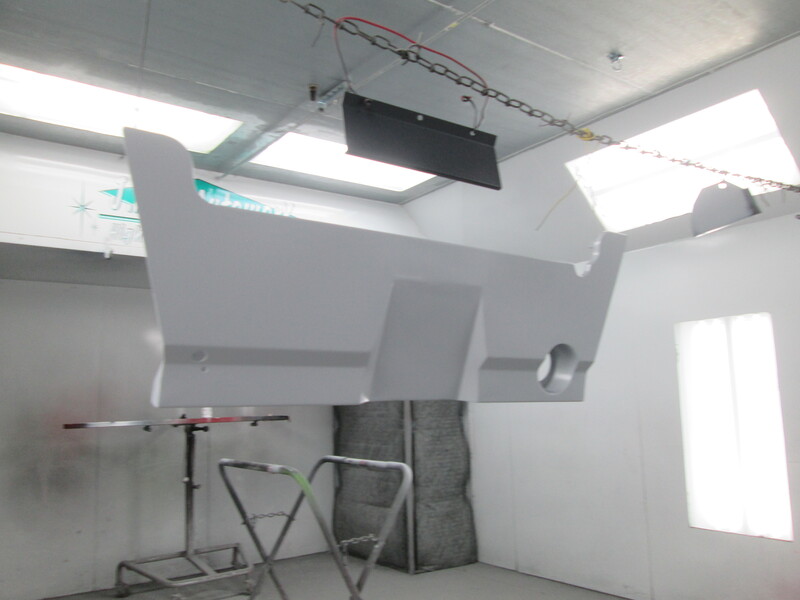 Since the running boards are new, there is no reason for a high build primer. 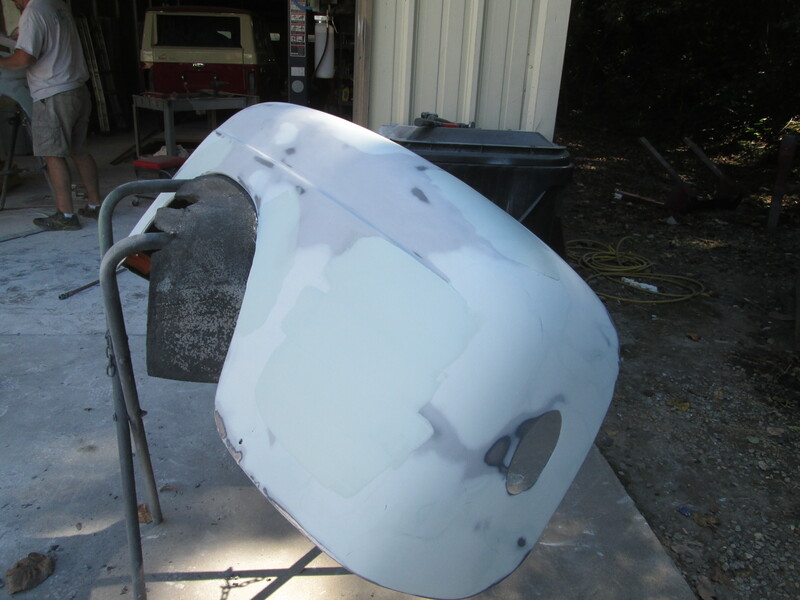 The other panels are all original and they do need a thicker primer. 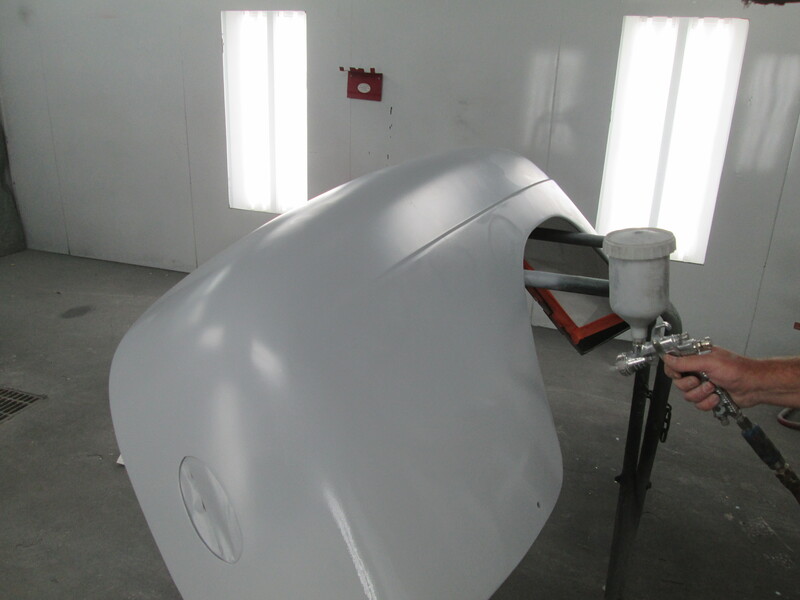 This is used to smooth out minor low spots and help make the panel flat and straight as an arrow. Stay tuned. We will keep you posted. Here is the latest update on the Ford truck. 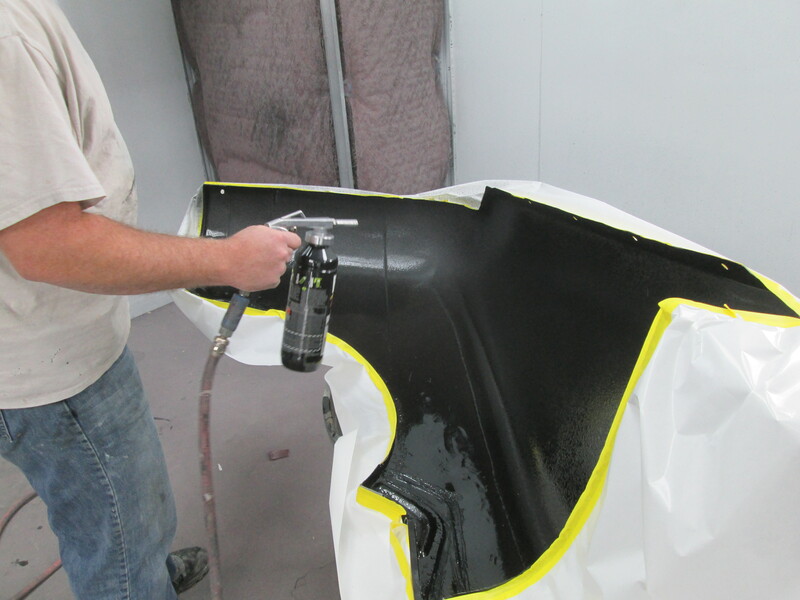 We applied POR15 to the inside of the fenders to protect them from rust. 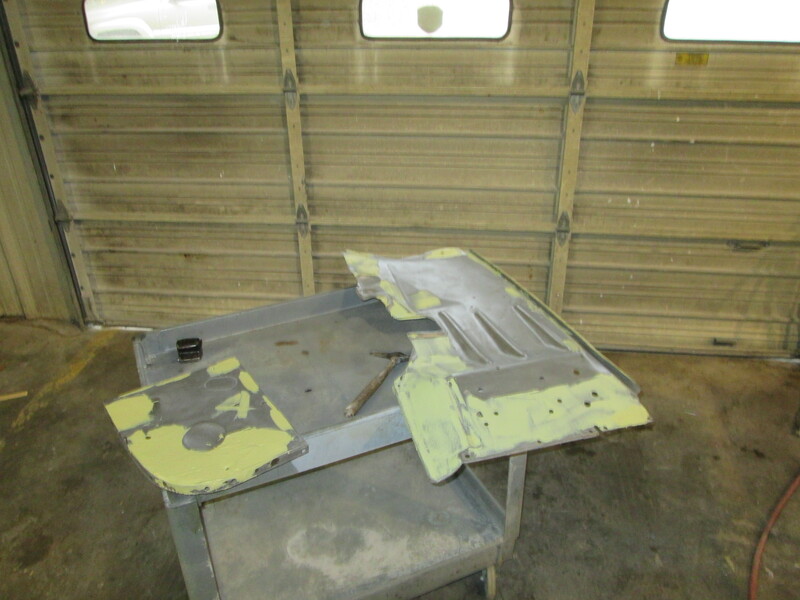 Once that had dried, a little seam sealer was brushed over where patch panels were welded in. 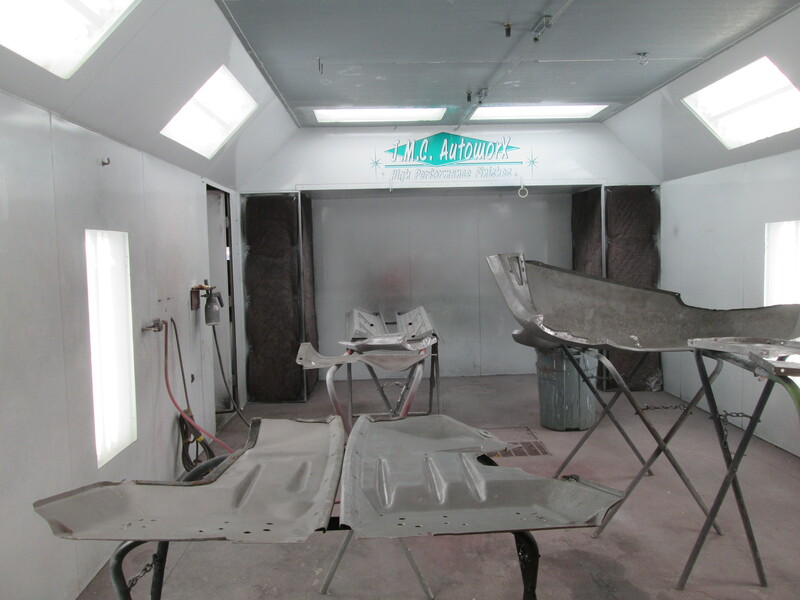 After the seam sealer had set up, Chris sprayed 2 coats of Raptor bedliner over the inside of these panels. This completely seals up the inner portions of the fenders. 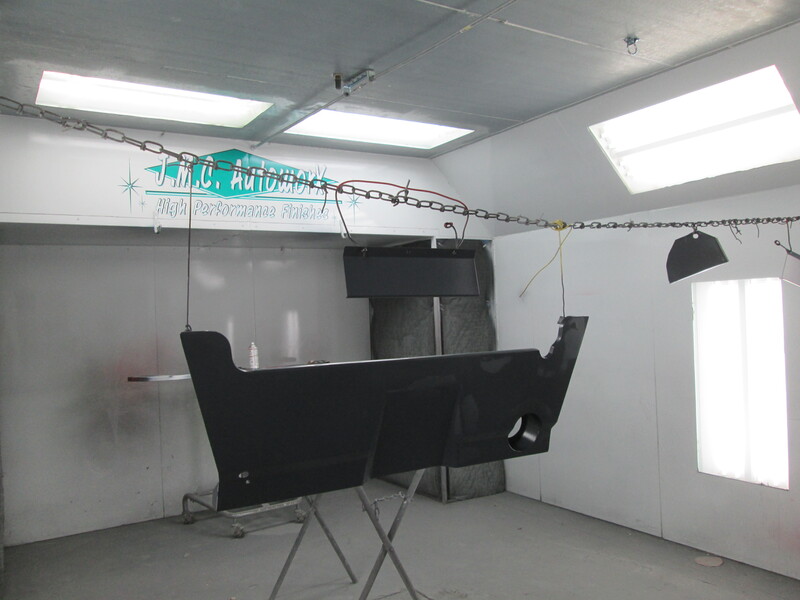 It will protect these parts from the elements and hazards of driving. 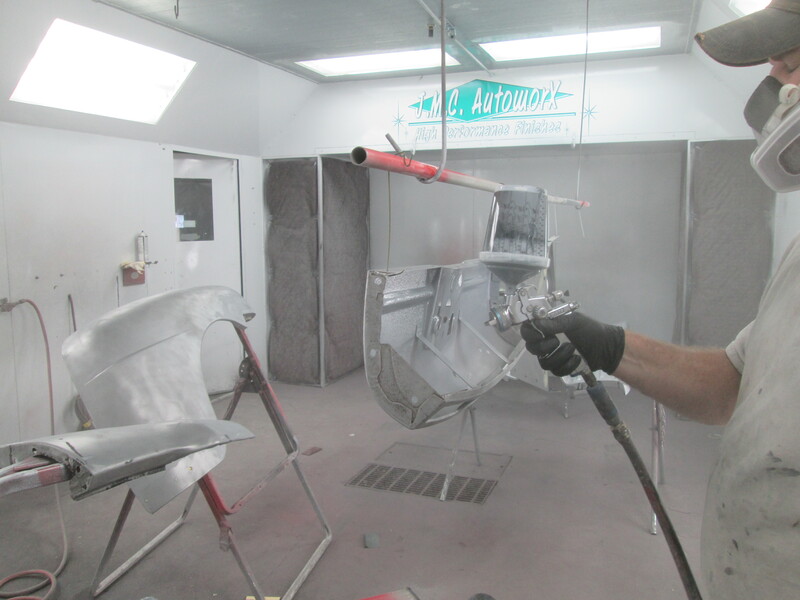 It it is a great product to apply on these areas on restorations that will be driven. It cleans up easily, its water proof and it looks nice. 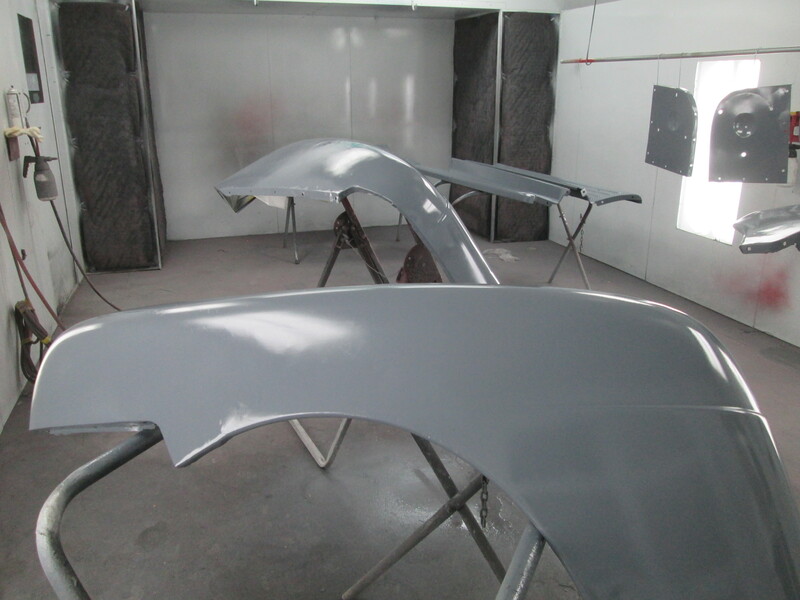 Next we will start on the shiny sides of these panels. 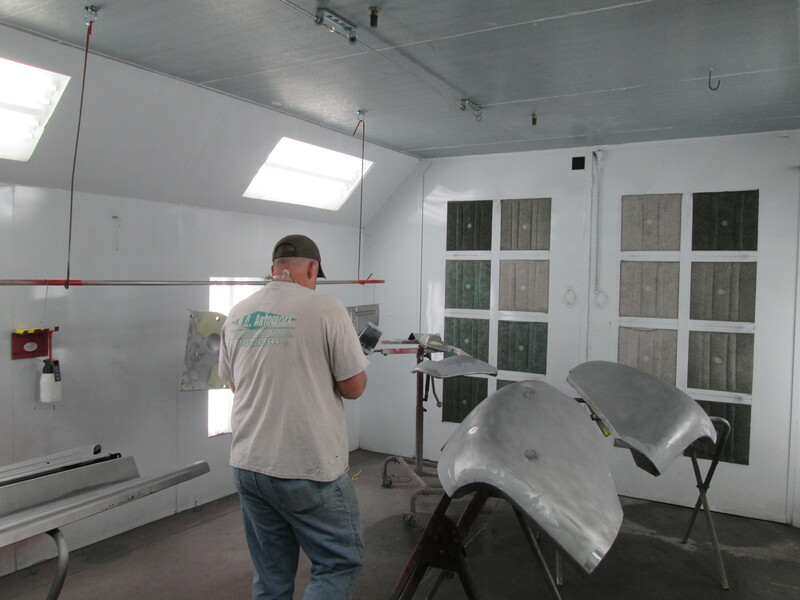 Today we made great headway, Chris and I spent almost the entire day prepping these panels for POR and primer. 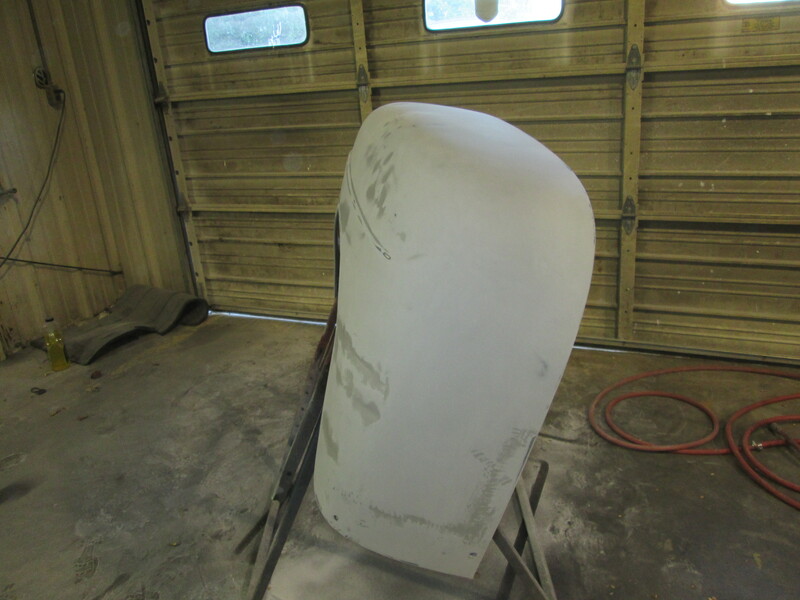 We welded up quite a few tiny pinholes and also went ahead and smoothed up some heavily pitted areas on the inner fender panels. 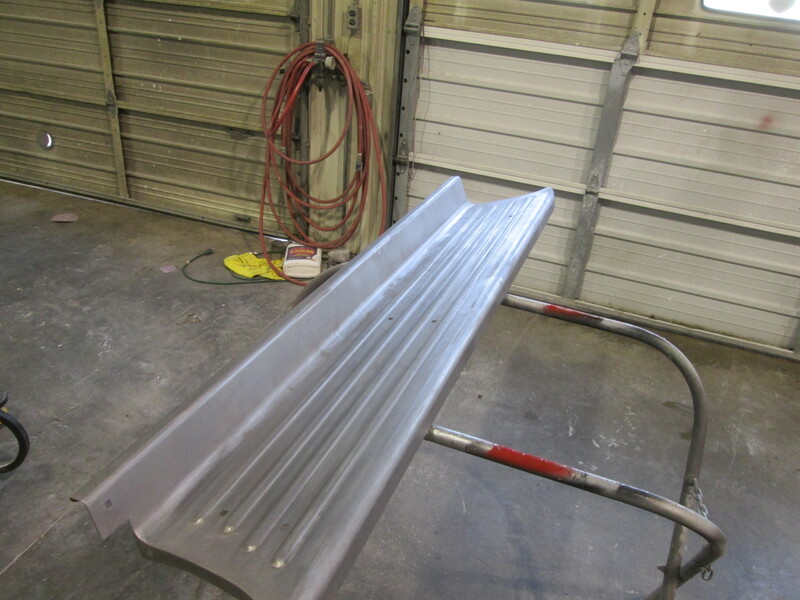 Tomorrow we will apply the POR to the bottom sides of these panels. 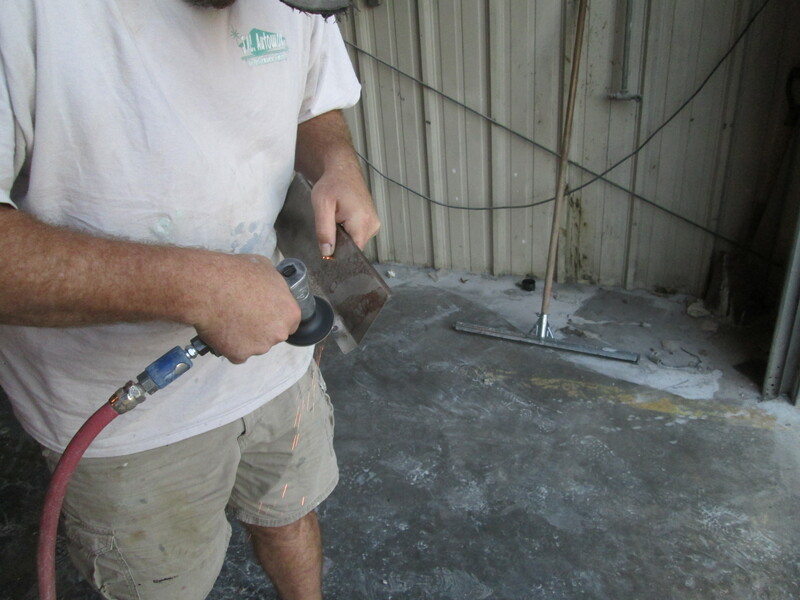 This will ensure that any rusty pits get completely sealed up. 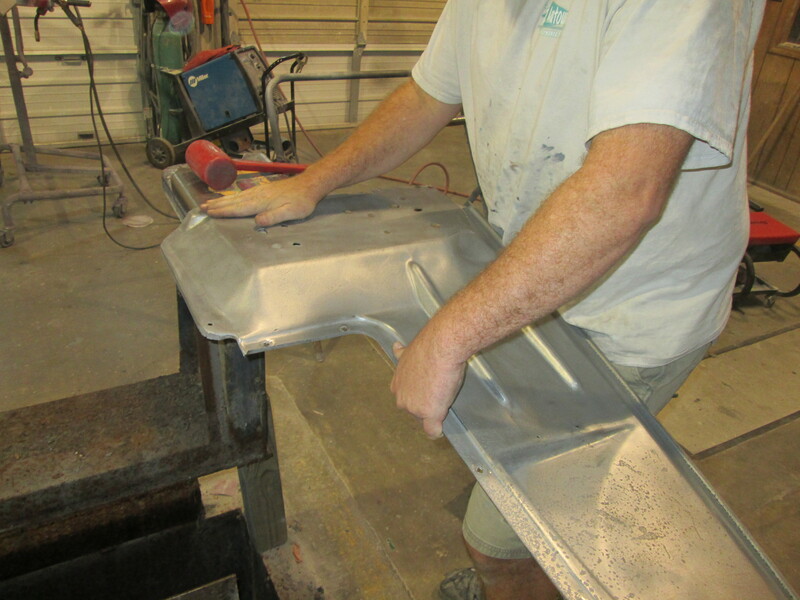 We will then seam seal the areas where rust repair panels were welded in then spray our bedliner material on them. 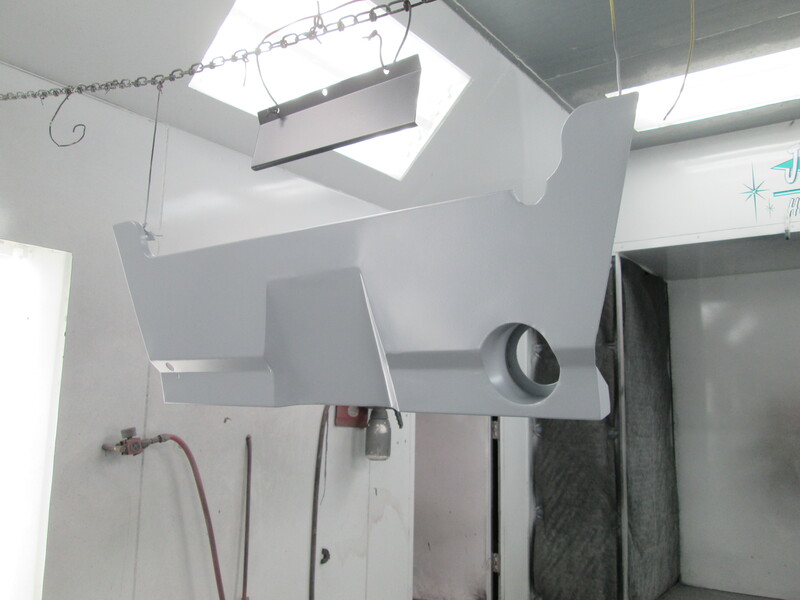 If that dries enough tomorrow we try to spray the primer on the other side. 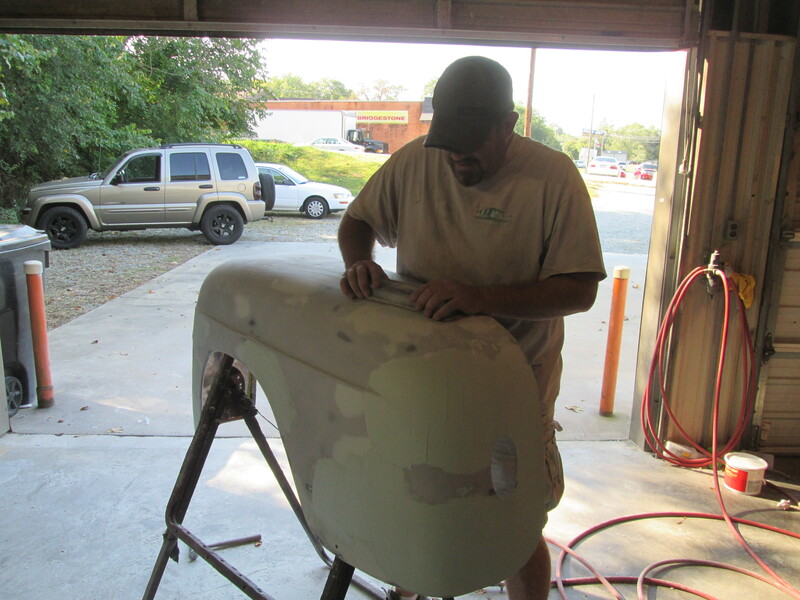 While I was busy painting the Chevy truck, Chris was working on the ’52 Ford truck. 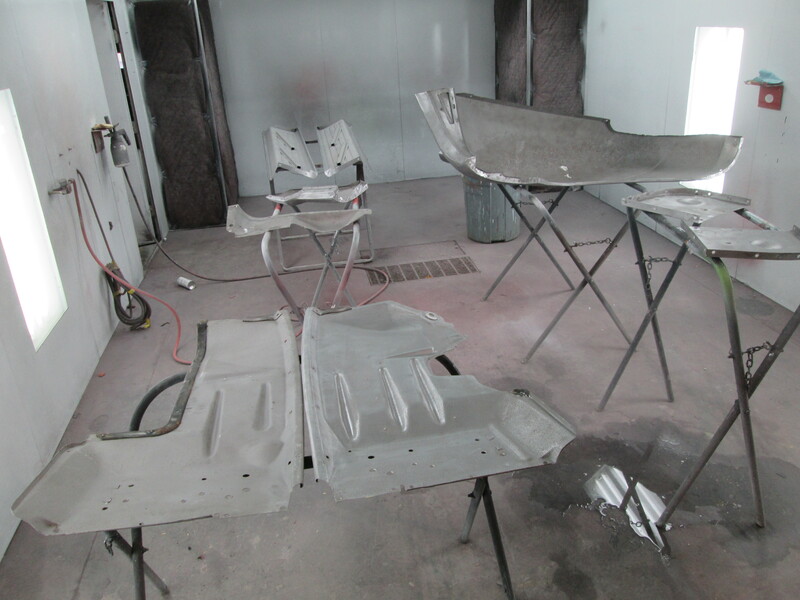 These parts have been to the sand blaster so they need prepping up before they get primed. 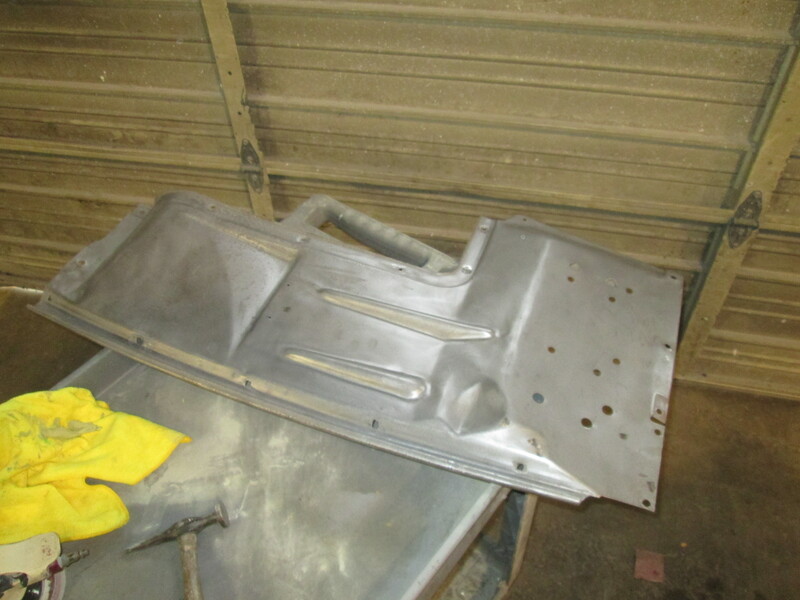 Chris got a few pieces sanded and also welded up a few pin holes that were in some of the parts. Tomorrow we both will be able to spend a full day on these parts so great progress should be made over the next few days. Another milestone reached today on the ’52 Ford. 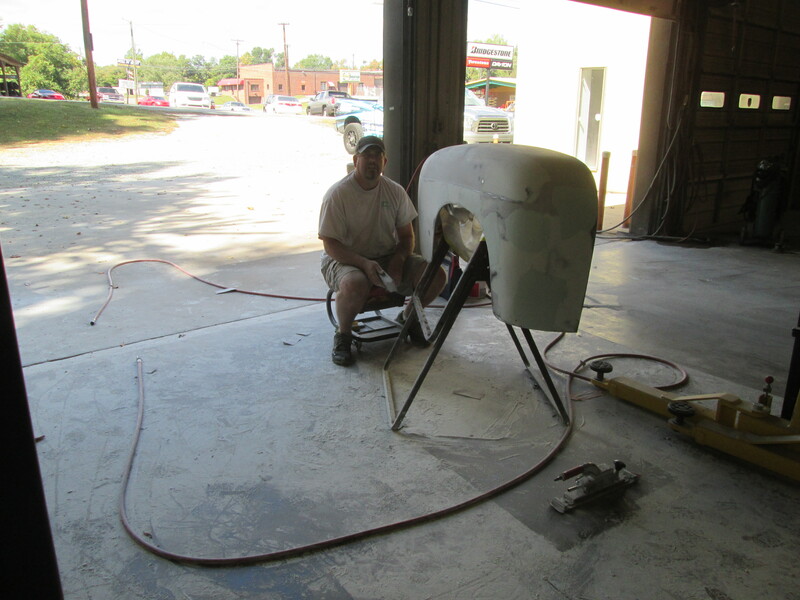 After all the hard work of getting the rear fenders straight, they were painted this afternoon. 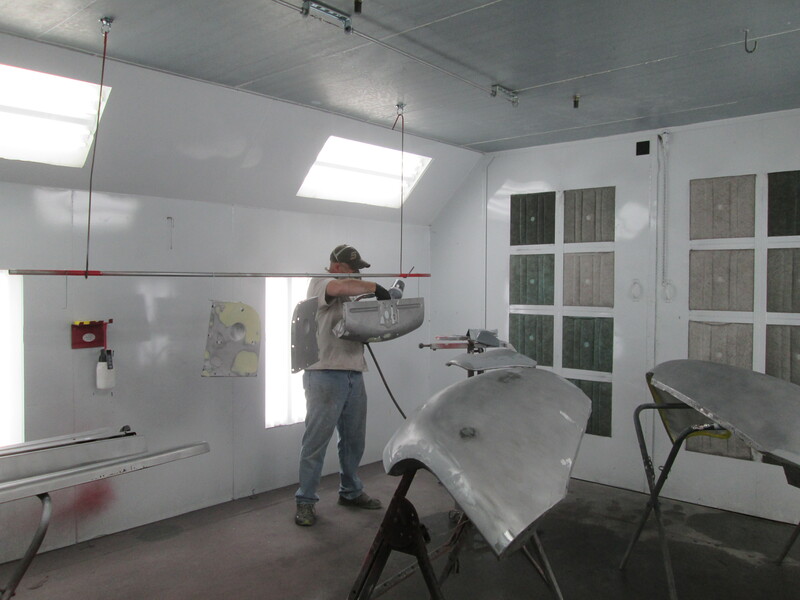 Chris and I spent the morning blocking out the final primer coat that was sprayed on last week. 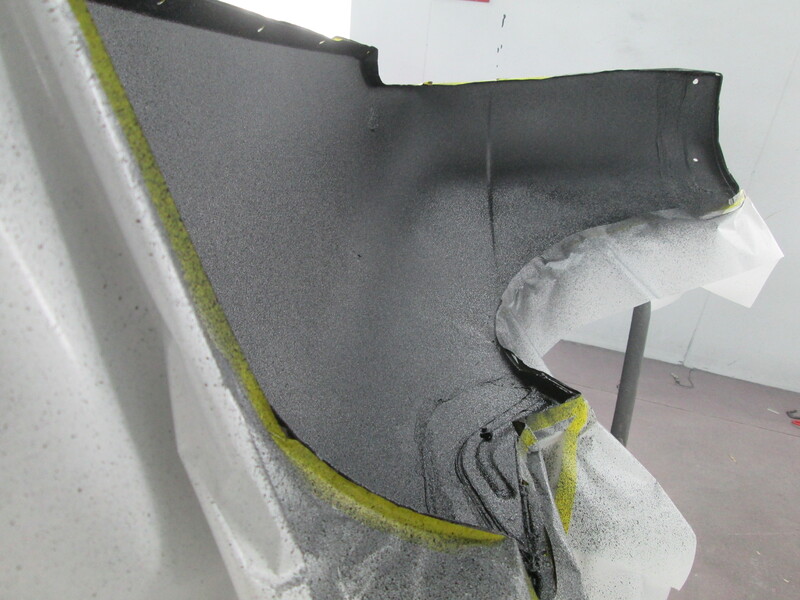 Once that was done, we went over the panels with a DA sander with a soft interface pad to remove the blocking scratches. 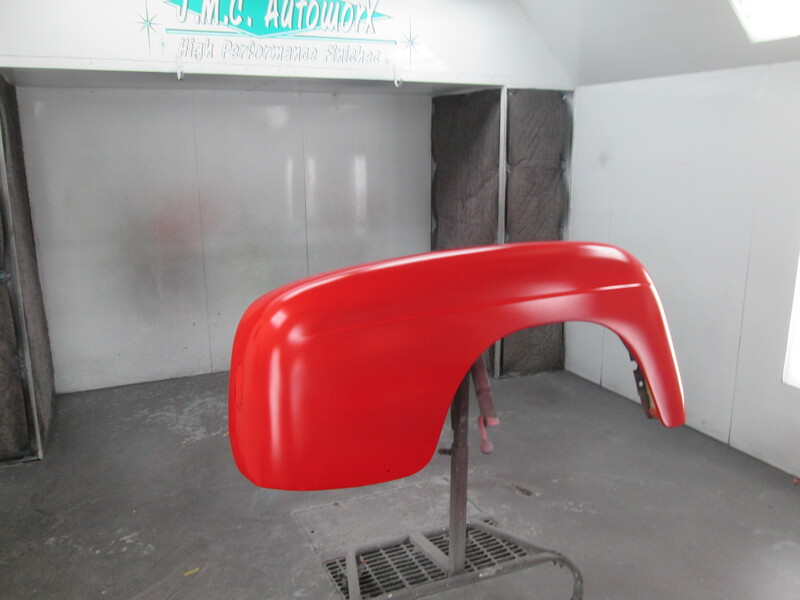 Once the sanding was done, we put the panels in the booth, masked off the back side of them to keep the red paint off of the bedliner then sprayed a coat of urethane sealer on them. 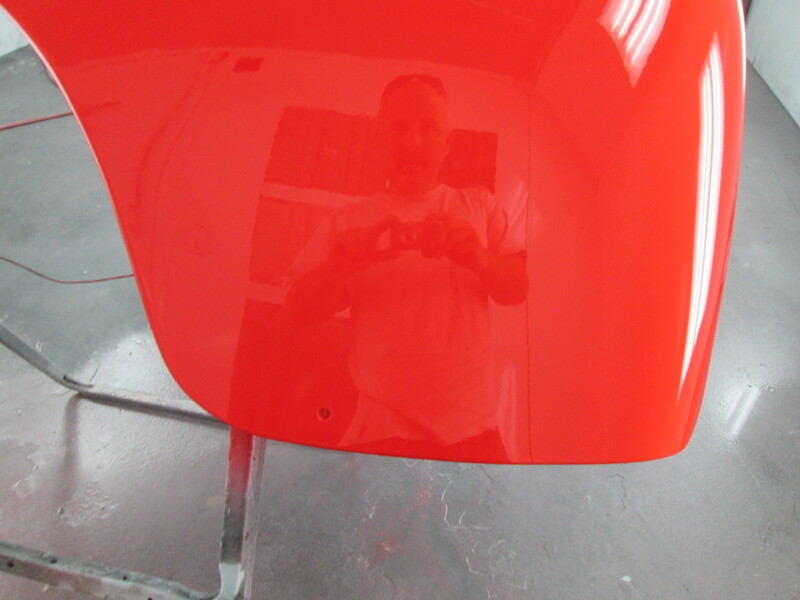 After the sealer was dry, 3 coats of red was sprayed. 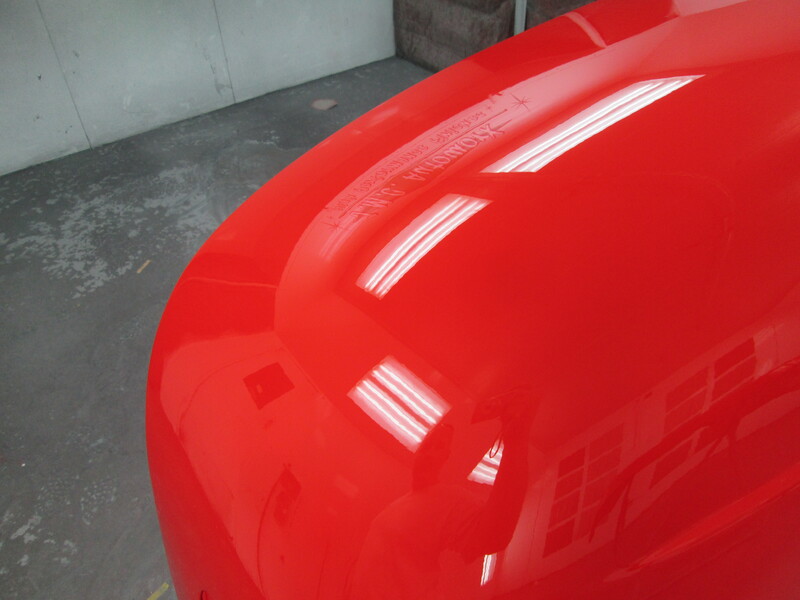 After those coats were dry, 3 coats of clear were laid down nice and slick. 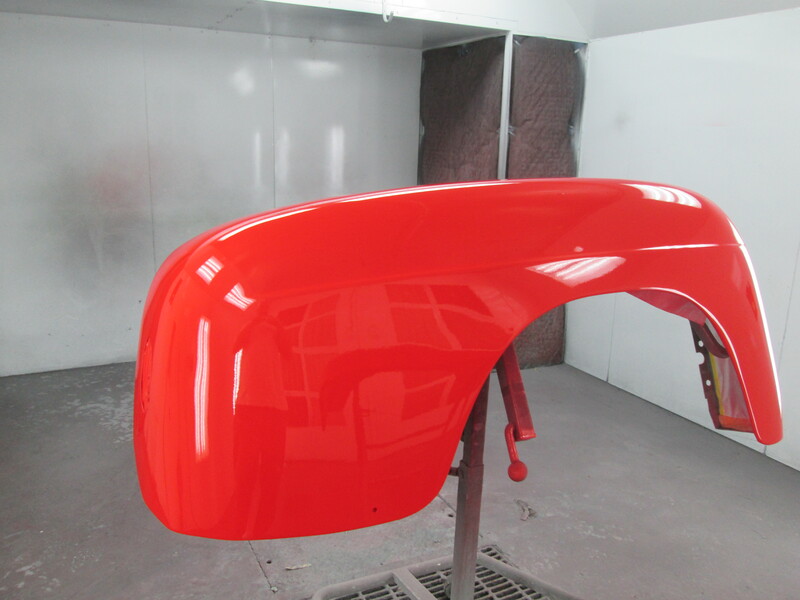 The clear coat will be sanded in a week or so and buffed back out to a super high gloss. 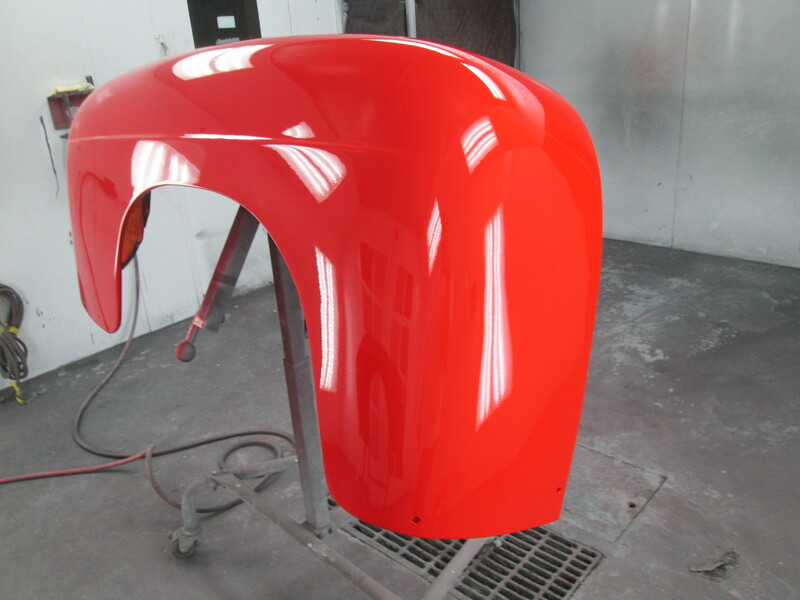 This process makes the paint look a mile deep and provides the ultimate in reflection. 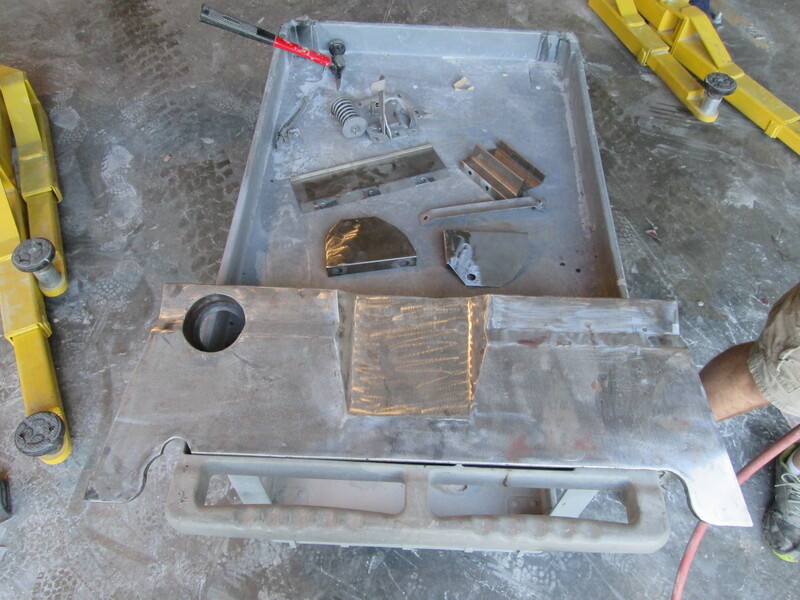 These are custom parts for the ’52 Ford. 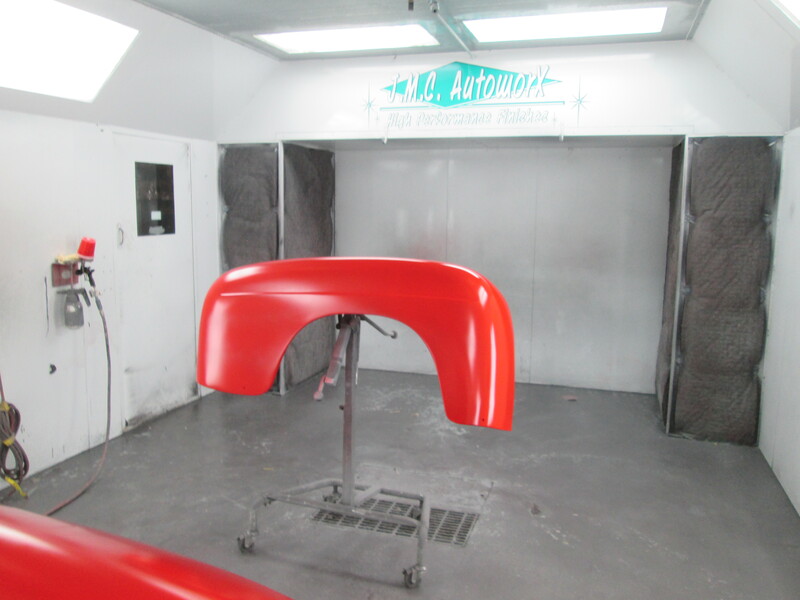 They are designed to fill in the area around the radiator to provide a finished smoothed up look when the hood is opened. 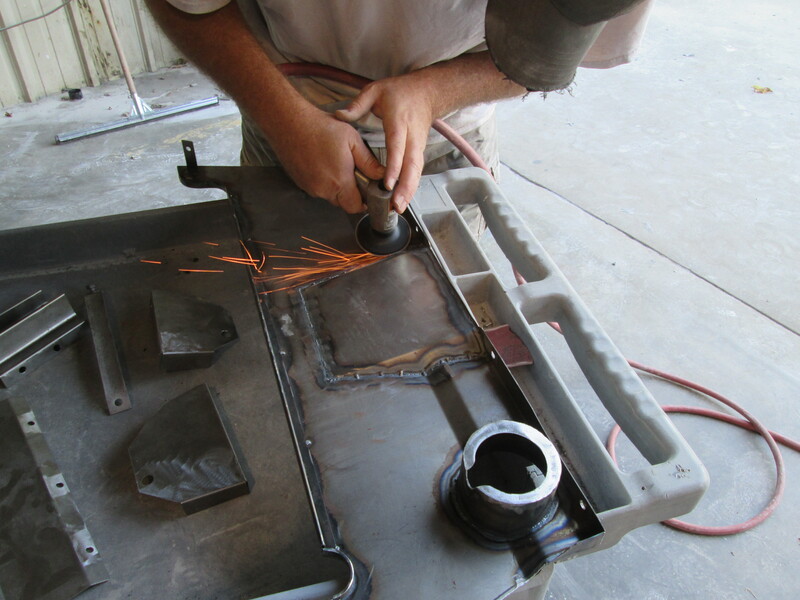 Chris started by grinding down all the welds and smoothing up some edges. 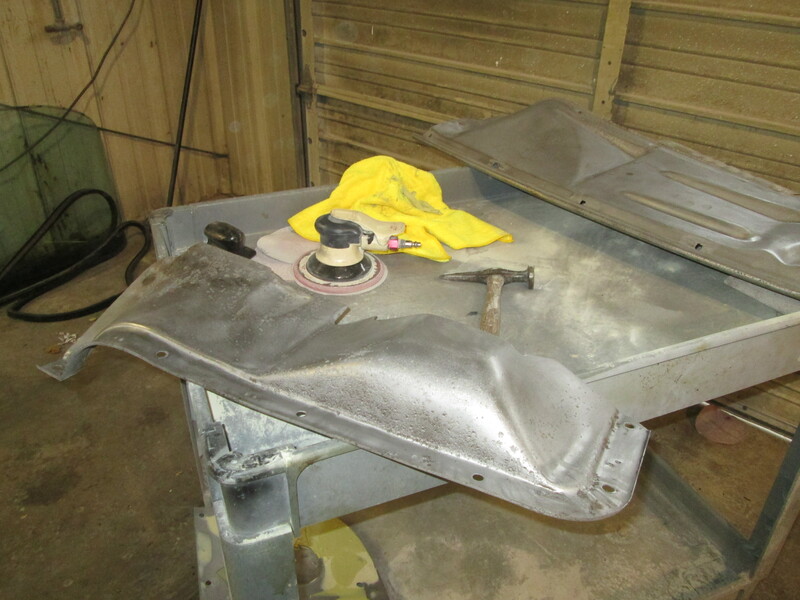 Then he repaired the top side of the large cover to hide all the welded areas. 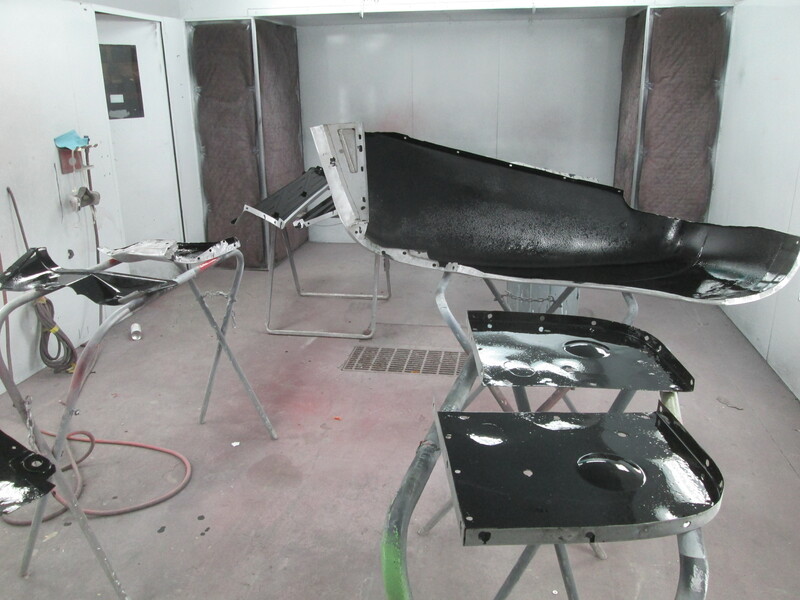 Once that was done, they were hung up in the booth and a coat of epoxy was sprayed on both sides of the parts. 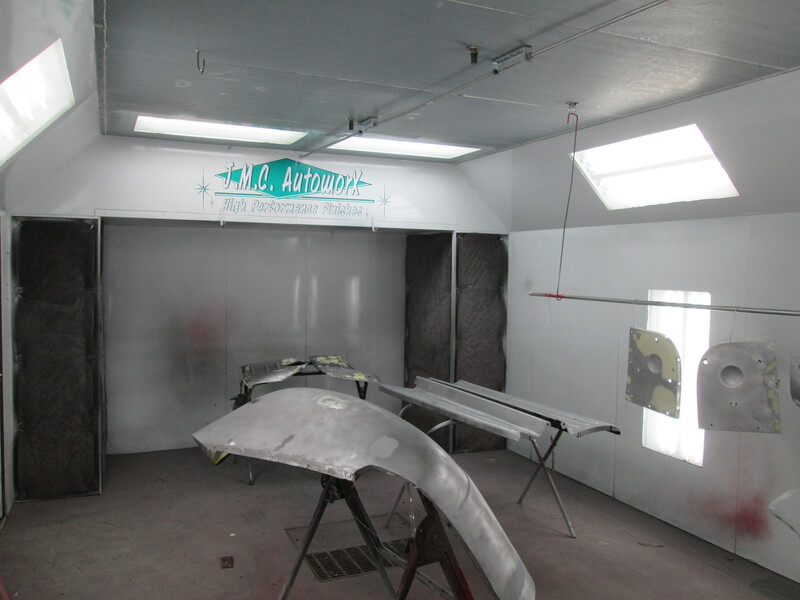 This coating is water proof and really adheres to bare metal. 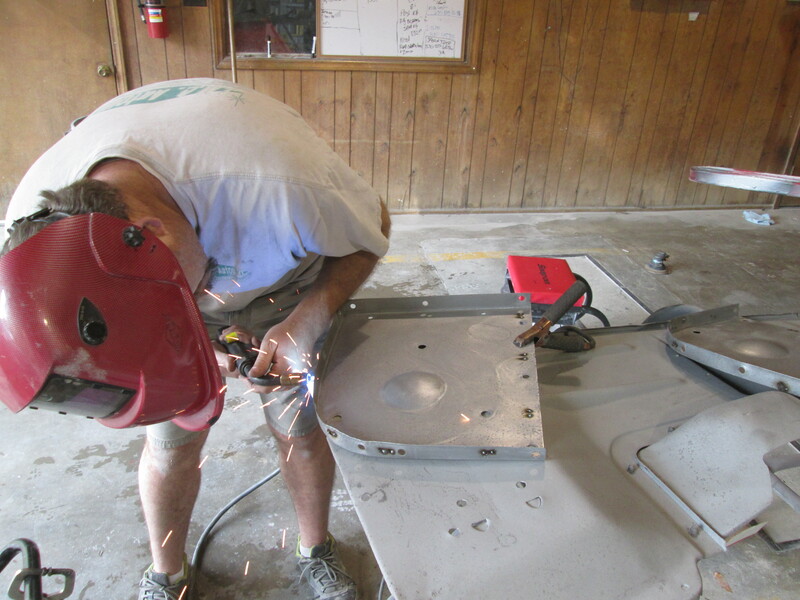 Once the epoxy had dried we seam sealed all the welded places up on the back side to keep water from getting in the welds. 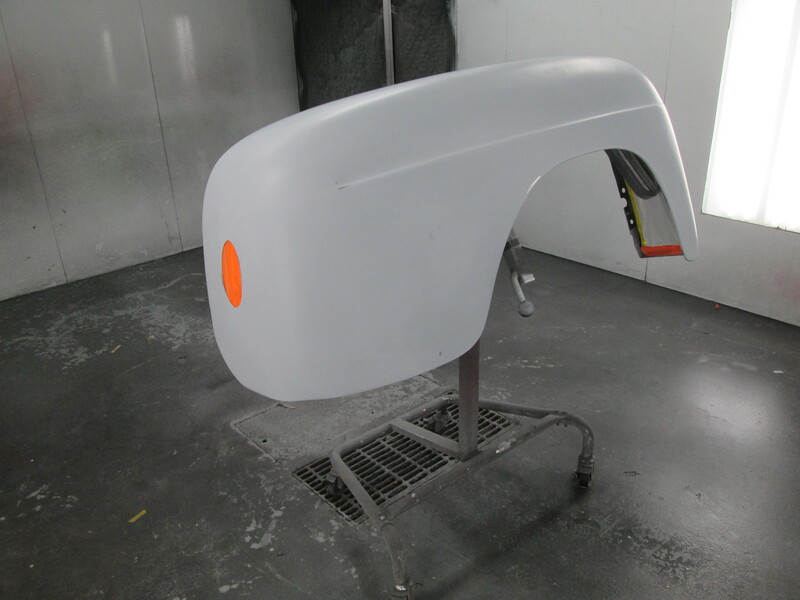 Lastly 3 good coats of urethane primer was sprayed on the bigger parts that will be seen. The other parts are basically brackets and braces. These pieces will be painted a flat black so the extra priming steps are not needed here. 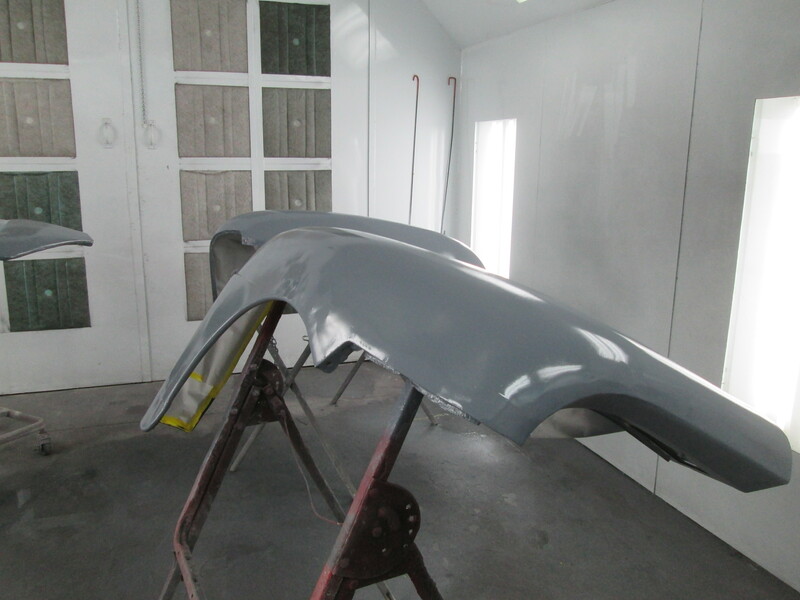 The grey primer parts will be body color and will look as good as the outside of the truck. Next week, we keep plugging along on this one. Have a great weekend!! 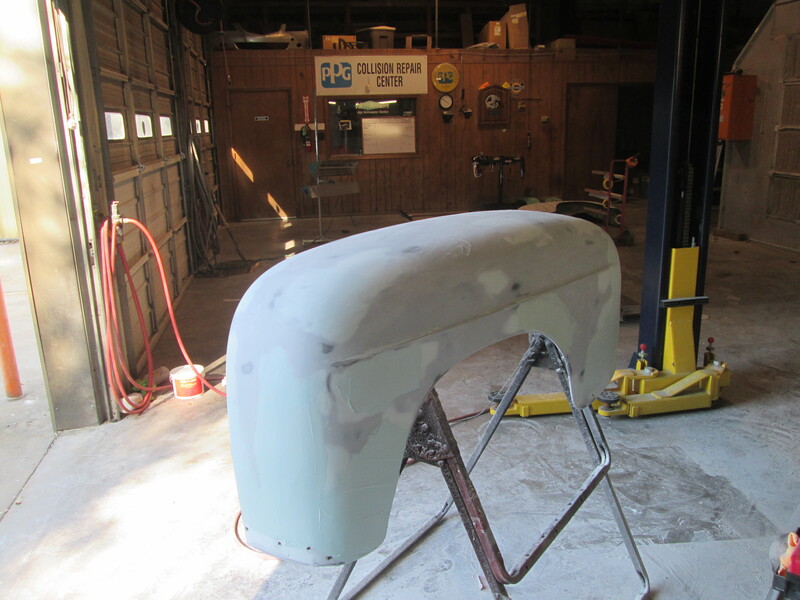 After spending a few days on these fenders, Chris has gotten them ready for primer. 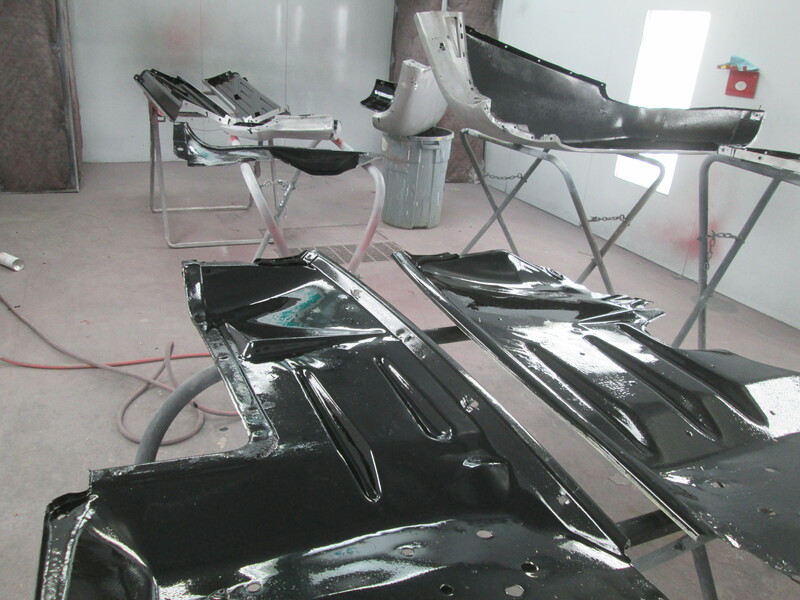 The body work has been moving along nicely on them of the past few days. 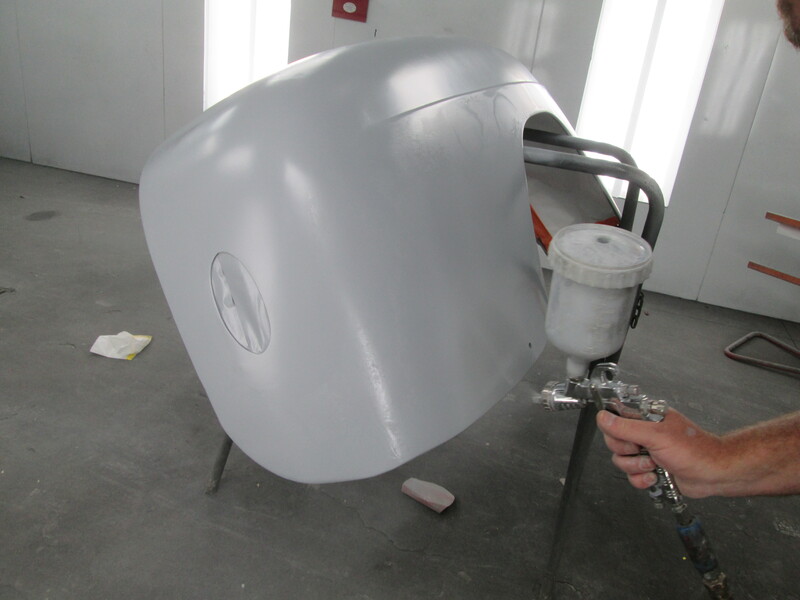 Its a tedious process of applying filler, blocking the filler ensure a flat smooth surface and repeating those steps where necessary. 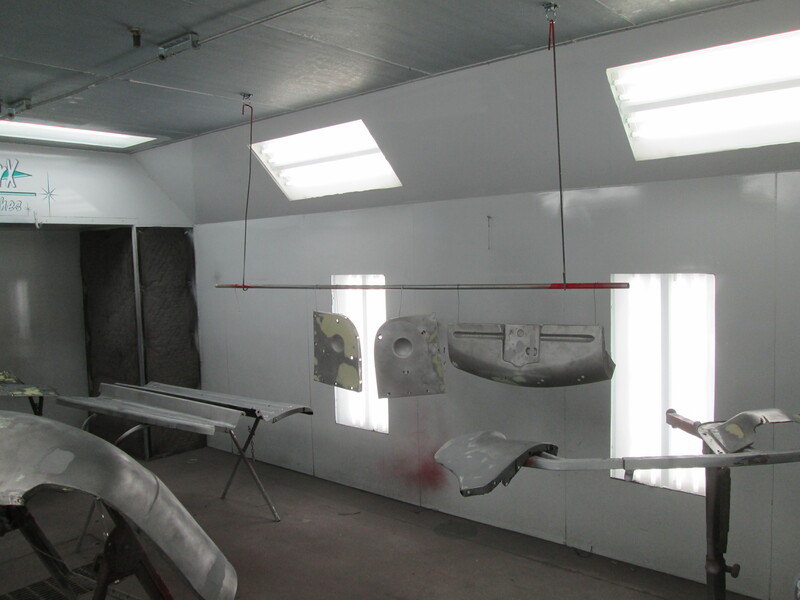 Towards the end of the day today, we primed them. 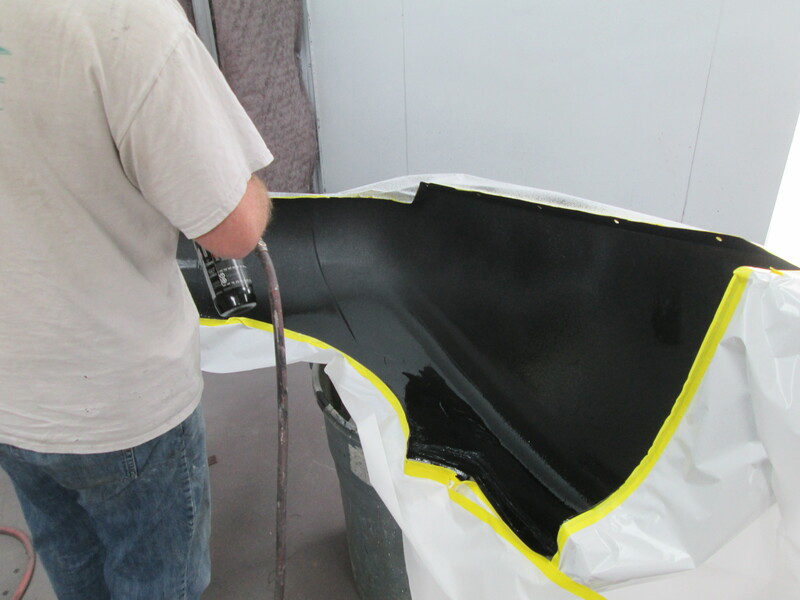 Tomorrow we will block out this primer, fix any places we missed and prime them yet again. 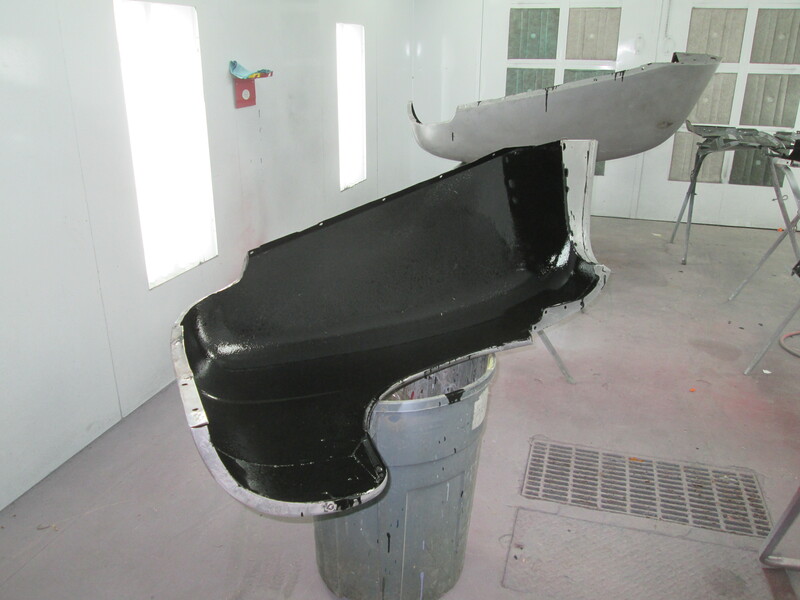 Yes, its a lot of steps but its necessary to ensure a quality repair. 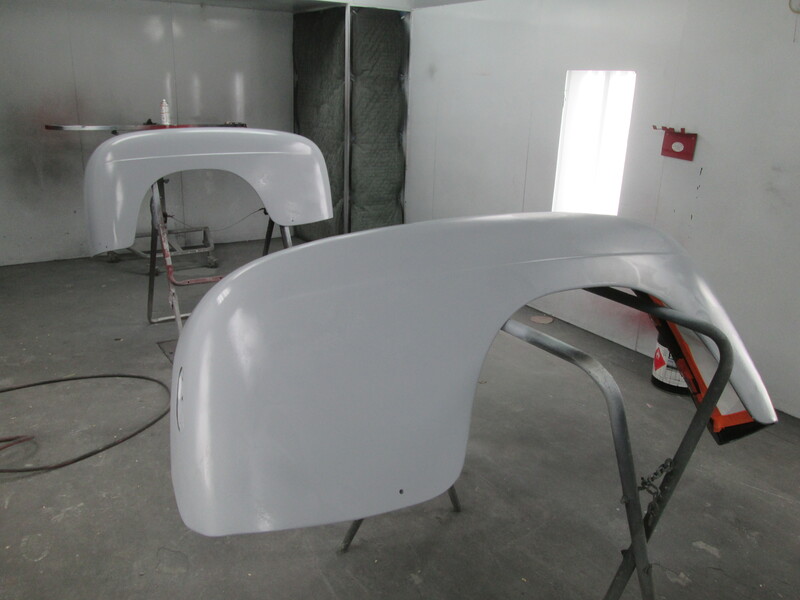 These are the rear fenders for the 1952 Ford pick up. 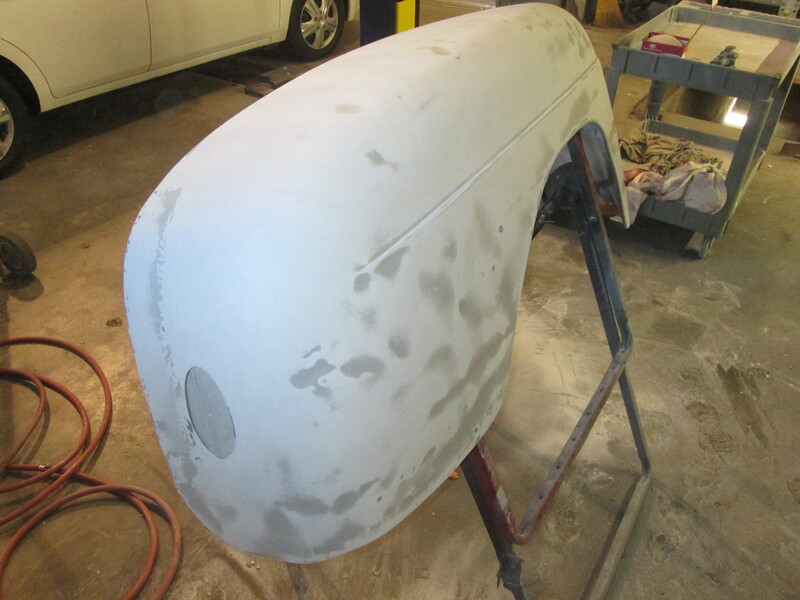 So far we have applied an epoxy primer and 3 coats of slick sand to the outside. 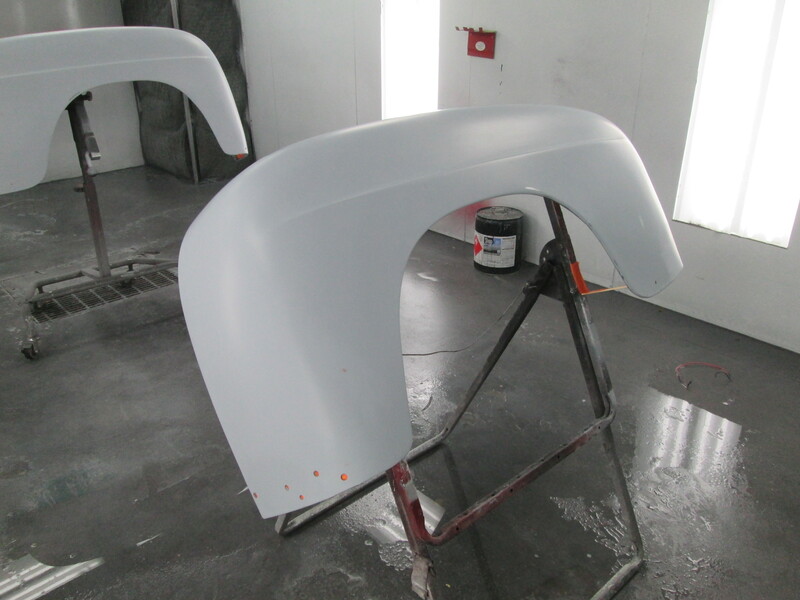 The inside of these fenders have been coated in POR 15 and has a couple of coats of Raptor liner. 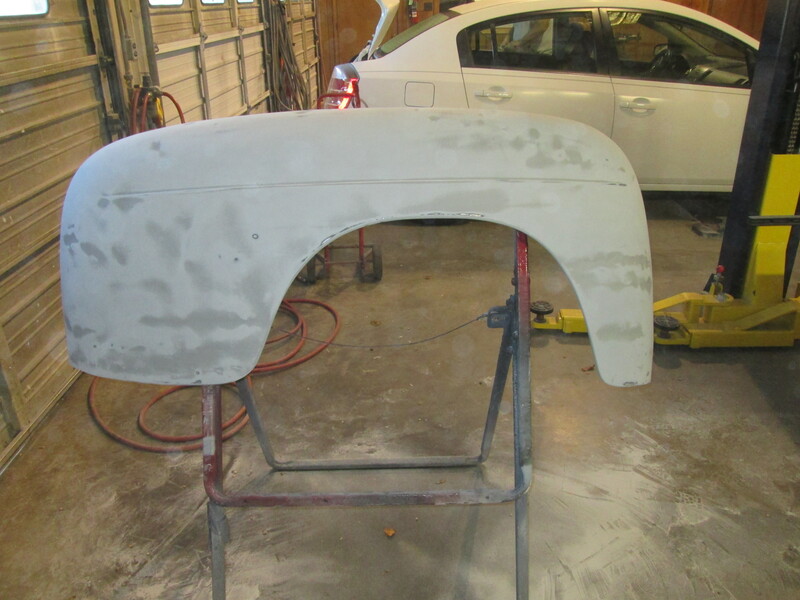 Today we sanded the Slick sand and started the body work process. 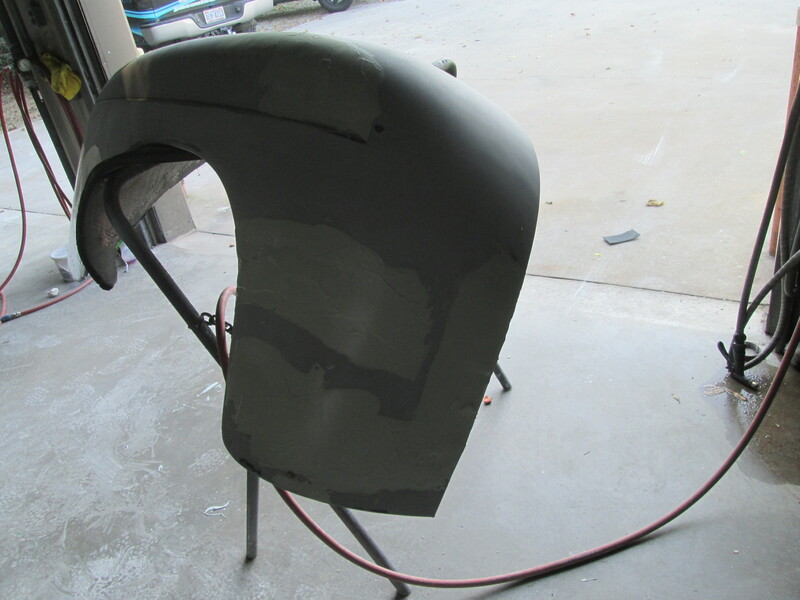 The darker areas of the fender are low, or where there are dents. Yes, there are quite a few of them. Chris got right to work first thing this morning. 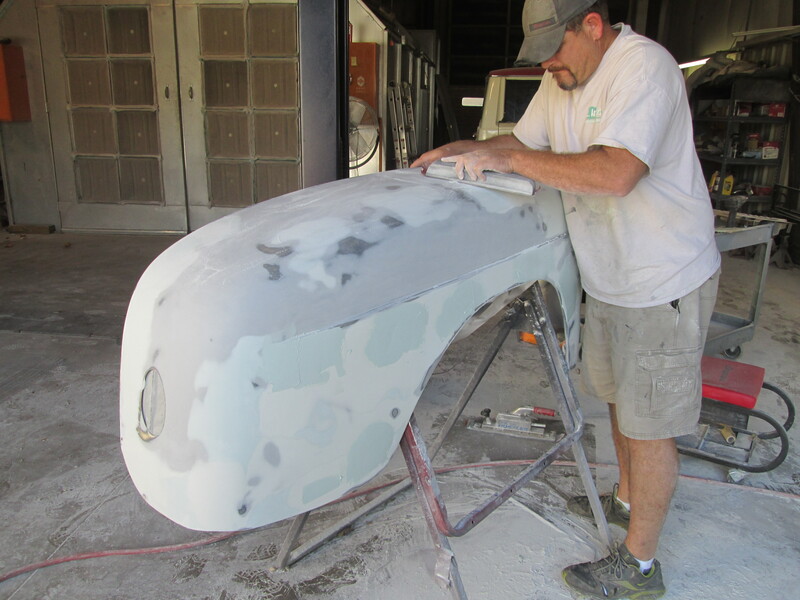 He started by sanding the panel to show the low and high spots. Once those were all located, he started spreading the filler. Once filler was in the spots the block party started. A block was used to flatten out the high spots and fill in the low. 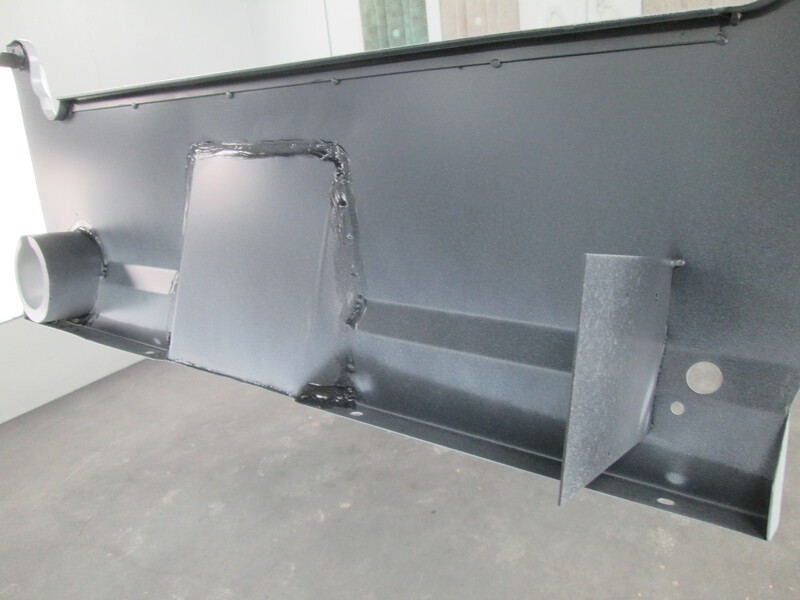 This process will be repeated until the panel is perfectly straight. 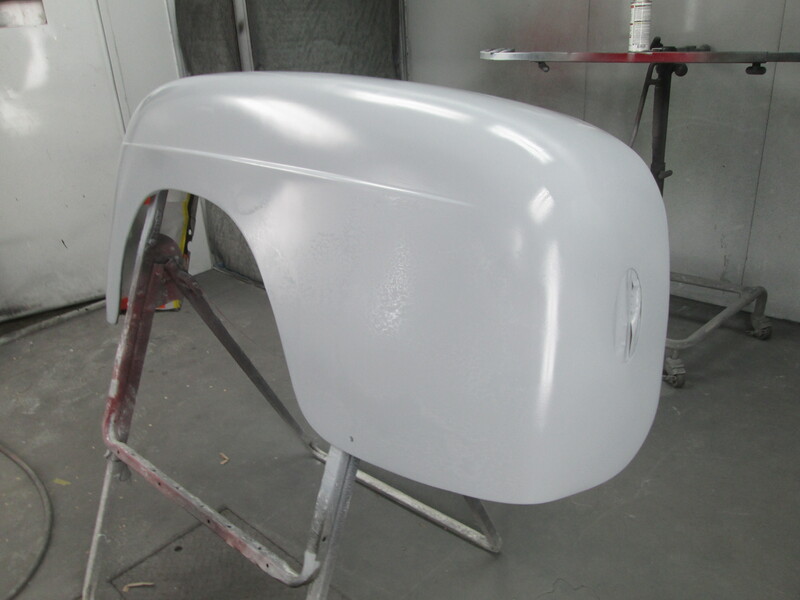 When the bodywork is all done, we will prime them again with a urethane primer. 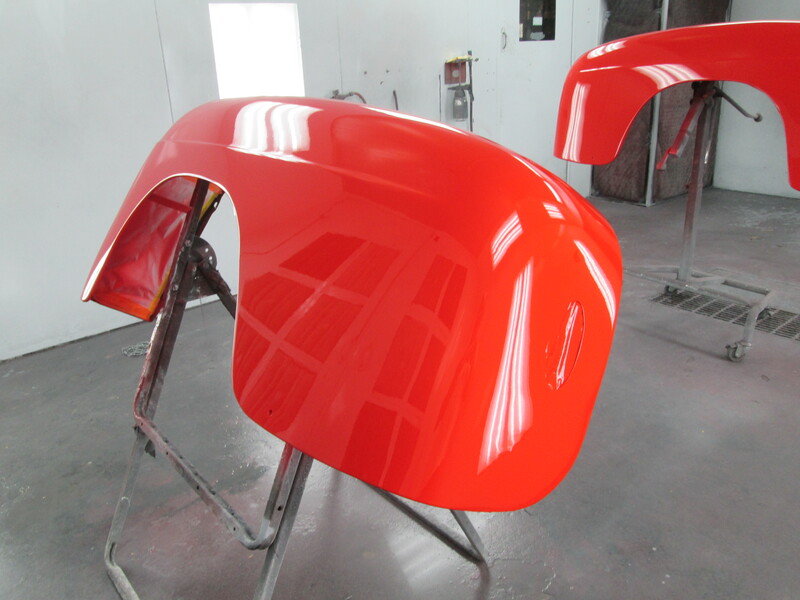 Tomorrow we continue the body work on these.